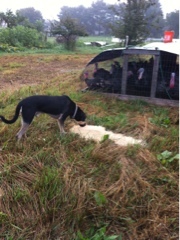 Most mornings the big dog accompanies Homer as the livestock is moved, fed and watered. A bit of feed for the poultry goes in front of the pen so they move forward to get it. The pen is repositioned so that the poultry is on clean ground and on top of the feed. The dog checks every portion set out. He takes a sniff and a taste, then moves along to the next pen. The poultry get to eat the feed and all that fresh green growth under the pen. And the next day it happens again. The Thanksgiving turkeys are growing beautifully.